Jennifer Beattie made 19 appearances for Manchester City this season as the club finished second in WSL1. 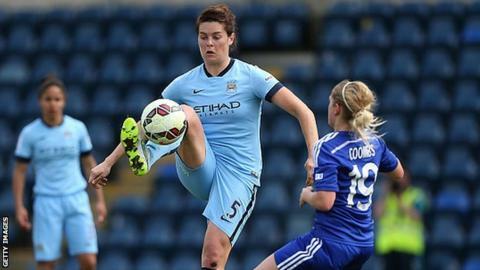 Manchester City Women defender Jennifer Beattie has joined W-League side Melbourne City on loan for the 2015-16 season. She becomes the first player to be loaned between the two sister clubs. The 24-year-old will return to Manchester in time for the start of the Women's Super League One season in March, following the climax of the the W-League in February. "I can't wait to get started," said the Scotland international. "This is a new challenge for me and one I'm really looking forward to. "The similarities between the clubs will definitely help me to settle quickly: the philosophy we both have, and of course the facilities." Beattie has played for Queen's Park, Celtic, Arsenal and Montpellier. She joins fellow Scotland international Kim Little and Wales midfielder Jess Fishlock on loan at Melbourne, after the Seattle Reign pair moved earlier in October. Melbourne, in their first year of existence, are top of the table after winning their opening two matches.